The Unique 6 is the perfect entry-level upright propane refrigerator. Consumers have been asking Unique for a value oriented propane refrigerator, one that fits the needs of a smaller cabin/cottage. Well, we are very pleased to launch the solution. 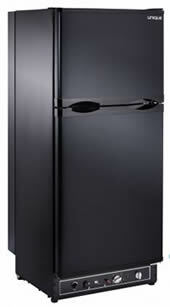 With a huge 1.5 cu/ft freezer, and a relatively tall profile, it is ergonomically excellent. You will find it very easy to access your food. The Unique 6 is dual powered (LP gas or 110 volt power option). Most people will use this refrigerator for a fully off-grid application, but you can also consider this fridge for “brown” energy requirements. If you frequently have electrical outages, why not use one of Unique’s dual power fridges to operate on 110 volt, then when electricity is lost, use on LP gas? At Unique, we are constantly improving our products to keep ahead of the curve. With clear storage drawers that provide improved functionality and appearance, the UNIQUE 8 is a great quality product that we are very excited about. In 2009, we introduced the Unique 8 Dual Power (LP gas/110 volt). This model will operate on propane, or if you have frequent power disruptions use our 110V and when the power goes out, switch to LP gas. UNIQUE Gas Products have sold 10,000s of propane fridges into the North American market over the decades – the UNIQUE 8 DP will continue to enhance our leadership position. 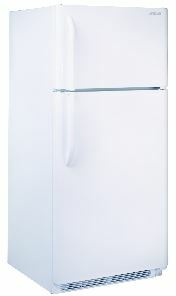 It's simply a great quality fridge, and we offer it in the SM (Standard), CM (CO monitor) and SV (Safe-T-VentTM) models. 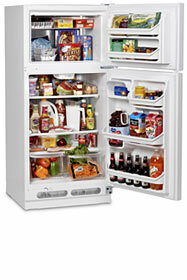 For a cost-effective mid-sized 7.8 cu/ft fridge, the UNIQUE 8 DP can't be beat. Listening to our customers, in the early 1990s UNIQUE spent over $100,000 and developed our Safe-T-VentTM Fridge. After years of development and over a decade of use, it's the answer for small cabins, airtight rooms or locations using older woodstoves. The Safe-T-VentTM works just like a direct vent fireplace. The system takes air from outside and after combustion safely allows flue gases to exit the building, therefore not using any inside air. Our innovative design allows for easy installation with a very small exterior outlet. Certified for all provinces and states in North America. For more information/details on the Safe-T-VentTM please contact us. The UNIQUE 10 is a perfect mid-size propane fridge. 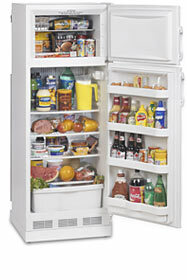 At 10 cu/ft, with a 2.1 cu/ft freezer, this fridge provides a step up in size from the Consul or Servel. With a clean, visually appealing cabinet, we're certain you'll fall in love with the UNIQUE 10. Upgrade and Upsize Easily - The UNIQUE 10 is of a similar width to the Servel or Consul. 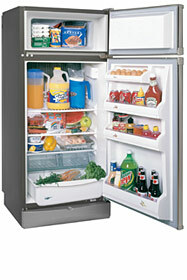 You can replace your older, smaller fridge with a larger more modern unit, without the need to modify your counters! Efficient & Ergonomically Designed - Specifically designed to suit your needs, you'll find more usable space than you might expect! 2.0 litre pop bottles fit perfectly in the door, and you'll find loads of room in the freezer for ice cream and all your other necessities. Innovative Modular Coil - Specifically designed for ease of use, this modular cooling system can be removed and sent separately for recharging, repair or replacement. 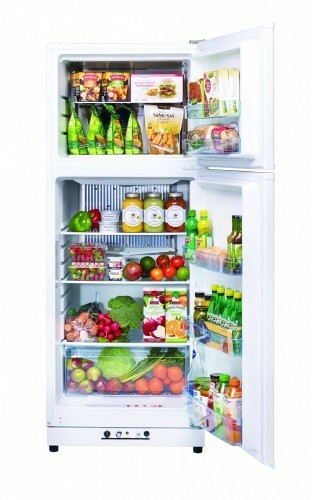 This reduces shipping costs and minimizes the potential for damage to the fridge. CSA Certified - Provincial authorities in Canada require all free-standing propane-refrigerators to be fitted with safety devices (i.e. carbon monoxide monitor or direct vent capability) to receive CSA approval. It is illegal to install a non-approved unit. Installing a non-approved/non-certified unit may void your cottage/home insurance coverage, either in Canada or the United States! UNIQUE has the only complete line of certified propane refrigerators on the market in North America today, and can be purchased in over 1000 retail stores throughout the continent. We have led the way in product design and patent innovation, investing whatever necessary developing our "Unique" product-line. Formerly the largest certified fridge in the world, the UNIQUE 15 is now the second largest certified unit in our product line-up. The UNIQUE 15 provides enormous functionality and capacity for those that need a large fridge while retaining the crisp, clean and modern look of the UNIQUE family. Stylish and Functional - A huge 10.8 cubic feet for the fridge, and 4.2 cu/ft for the freezer provides tons of room for all your requirements. This fridge is almost double the capacity of the Consul, which has been the industry standard for decades! Efficient & Ergonomically Designed - Specifically designed to suit all your needs with unprecedented interior space and clean, modern styling. The UNIQUE 15 boasts removable glass shelves and crispers making the interior every bit as attractive as the exterior. 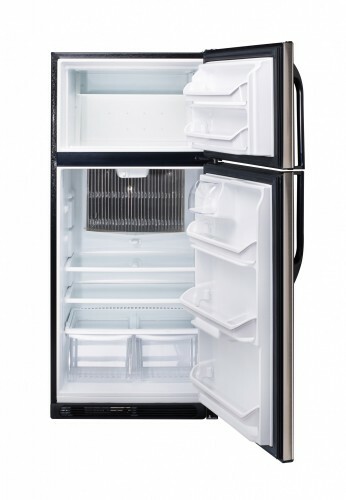 A huge 4.2 cubic foot freezer provides space for your ice cream, meat and even bags of ice for your drinks! If you’re looking for extended stays at the cottage/cabin then the Unique 22 provides the functionality and capacity for those requiring one of the largest certified propane fridge in the world. Clean, Modern Lines – An enormous 16.2 cubic feet of space for the fridge, and 5.9 cubic feet for the freezer add up to a whopping 22.1 cubic feet of total space! Efficient & Ergonomically Designed to suit all your needs with unprecedented interior space and clean, modern styling. The Unique 22 boasts removable glass shelves and crispers making the interior every bit as attractive as the exterior. 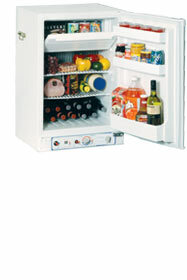 A huge freezer provides space for your ice cream, meat and even bags of ice for your drinks! Unique is really excited about offering this new product. It allows you to use it in many different applications - of course on LPG for off-grid use, but also 12V for use in the truck on the way to your cottage/camping. It can also be used on 110V, then when the power goes out, you still have refrigeration (using it on LPG). 3-Way Operation - With the ability to function on 110V/12V and LPG, this fridge can be used in a variety of applications. Whether camping, using at your cottage or keeping food cold on the way up, this fridge suits your different needs.